This year’s San Diego Festival of Science and Engineering Festival will kick off with “Expo Day” on Saturday, March 3, at Petco Park. Expo Day is a free, one-day event of the festival, featuring 130 exhibits with hands-on learning activities and experiments. The event will be held 10 a.m.–5 p.m. at 100 Park Blvd. Highlights will include a U.S. Air Force Rapid Strike Simulator, a healthy lifestyles area, a Pre-K Zone, TEDxKids@ElCajon and more. Two main stages will host STEM-inspired performances from Fleet Science Center, Mad Science, and math rappers The Music Notes, among other groups. The 10th annual event — one of the nation’s largest science festivals — will run through Saturday, March 10, and is expected to draw over 65,000 people. For more information, visit lovestemsd.org. In an effort to engage students with the science, technology, engineering and mathematics (STEM) sector, MilliporeSigma will bring the Curiosity Cube to seven San Diego locations. 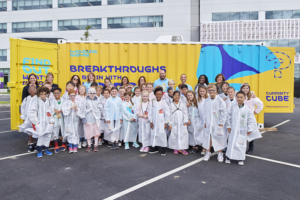 Curiosity Cube — brainchild of global life science company, MilliporeSigma — is a 22-by-10-foot, retrofitted shipping container, now transformed into a solar-powered mobile science lab. It features three hands-on science experiments, virtual reality, 3-D printers and more. The Cube is available for students at the San Diego Festival of Science and Engineering on Saturday, March 3. Additionally, the touring lab will be stopping at various schools and events in Ramona, Carlsbad and Temecula. For more information on the Curiosity Cube, visit thecuriositycube.com. For event details, visit lovestemsd.org. San Diego Downtown Lions Club invites the community to celebrate its 95th anniversary on Tuesday, March 13. The Lions Club International is the world’s largest service club organization, and the Downtown chapter is one of the biggest in the nation. This free event will take place 4–7 p.m. at Lions Manor, Sheffield Room, 310 Market St. All attendees must be 21 years or older and RSVP online. The evening includes food from Mexican restaurant Las Hadas, live music from steel drummer Patrick Burke, games and raffles. Attendees are encouraged to bring along ideas for helping individuals in the Downtown region, as well as business cards to enter in the opportunity drawing. For more information and registration, visit bit.ly/2sZv0rB or call 619-239-7264. Mayor Kevin L. Faulconer has proposed to stop late fees for the San Diego Public Library system. According to Mayor Faulconer, these fines often discourage individuals from using the library. The new model is intended to motivate these people to check out books and utilize library resources. Instead of late fines, patrons would only be required to pay for a book replacement if they do not return it within 30 days after the first overdue notice. This notice is given after the fifth, and final, renewal period. Aside from replacement costs, the patron would not accrue additional fees. Though the city currently collects $700,000 in overdue fees, over $1 million is spent for staff and materials to handle these fines. Most of the individuals billed with these late fees live in low-income communities, according to a library analysis by local zip code. Mayor Faulconer’s proposal is a component of the city’s annual review of user fees, which will be in April. For more information about the library, visit sandiegolibrary.org. The 17,462-square-foot property located on the corner of Fifth Avenue and G Street recently sold for approximately $20 million. Colliers International San Diego Region, a real estate company, represented the seller, ASB/Blatteis, and the undisclosed buyer. 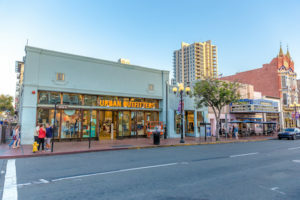 Bill Shrader, senior vice president at Colliers International, noted that the Gaslamp Quarter is an appealing option for retail shops in California. The space is part of a three-unit property, which houses Urban Outfitters and Ghirardelli Ice Cream & Coffee Shop. These two companies have been tenants of the building since the late 1990s. The Hopper, an integrated transportation and attraction service, will launch in San Diego this spring. The double-decker buses feature food concessions, Wi-Fi, electric outlets and on-board restrooms. All buses are ADA accessible and include underground storage. Customers can hop on and off the busses at six locations: Balboa Park, Embarcadero, Gaslamp Quarter, Little Italy, Old Town and Seaport Village. The Hopper Plus package includes access to local attractions, such as Hornblower Harbor Cruises, the USS Midway Museum, Maritime Museum and more. For more information, visit RideTheHopperBus.com, email hello@ridethehopperbus.com or call 833-RIDE-HOP. The Parkinson’s Association of San Diego will hold its annual “Step by Step 5K” fundraiser on Sunday, April 8, at Liberty Station. The dog-friendly, walking event will feature live music, a beer garden and an expo. Check in starts at 7:30 a.m. and the walk begins at 9 a.m. Registration fee is $50 and includes a T-shirt. Sponsorship and vendor opportunities are also available. RideFACT will provide free transportation for individuals needing assistance. All proceeds will benefit the Parkinson’s Association of San Diego, a group that helps connect resources to local individuals with Parkinson’s disease. For more information and event registration, visit bit.ly/2t0udXq or call 858-200-7277. 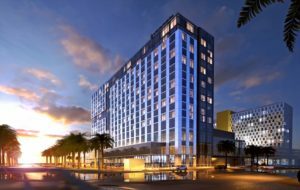 InterContinental San Diego, a new 400-room hotel on the Downtown waterfront, is expected to open fall of 2018. This new establishment is part of Associated Luxury Hotels International’s (ALHI) West Coast expansion, which also includes a second California location, Portola Hotel and Spa at Monterey Bay. The San Diego hotel will include 35,000 square feet of meeting space, 7,000 square feet of outdoor space, two ballrooms, a restaurant with a bar, and an additional rooftop bar — The Sky Bar — with panoramic views of the Downtown area. It is located five blocks from Gaslamp Quarter, six blocks from the San Diego Convention Center and two miles from the San Diego International Airport. For more information, visit alhi.com or call 866-303-ALHI (2544).